I know, right? Such a weird thing for Godiva to put on their spring line a couple of years ago. 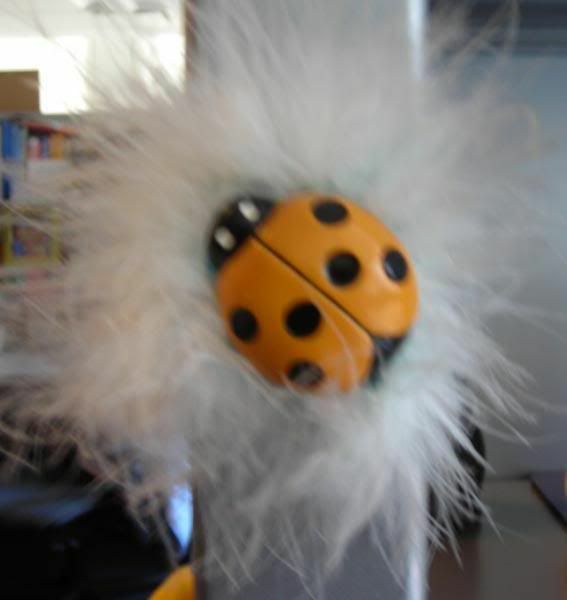 It's a creepy little ladybug with a weird feather puff surrounding it. I'm sure someone thought it was neat and artistic to put a ladybug magnet on the box. For sure, I ended up keeping it, and am still talking about it years later. And, kids love this thing. For some reason, it's the feathery puff that attracts them. All the kids that come to the office love to touch that particular magnet, running their little hands softly over the feathers. I, for one, can't stand ladybugs, but that's because our house in NC is totally inundated with them - they're everywhere. And we can't kill them, because Mom says they're good luck. First, ewwww. Second, ewwww. Third, still waiting on all the luck. Should be truckloads by now. I got chills just looking at this thing! And, according to your Mom, it's all your old books that are attracting them. LadyBug Shop - www.LadyBug-Shop.com - The largest collection of ladybug products on the Web!